Most people in our home love cookies. After Christmas, I was banned from making cookies for a while but I love to bake. I really love to bake. These oatmeal and coconut cookies may be one of my favourites. 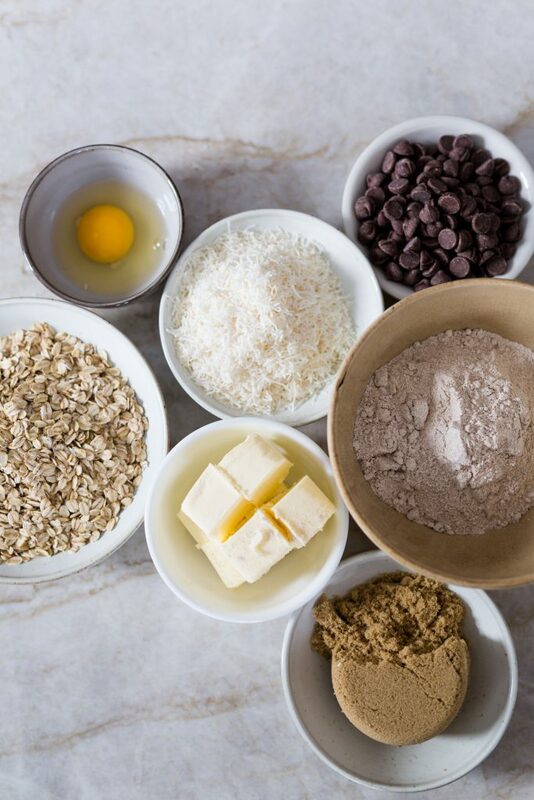 I wanted to create an oatmeal cookie that had enough of the good things that kids love and enough of the things that adults or parents love, healthy ingredients. While these cookies have sugar and butter, they are made with sprouted spelt, whole oats and coconut. No processed fats here. I undertake these cookies slightly so that when you bite into them, you get a crunchy outside and chewy centre. 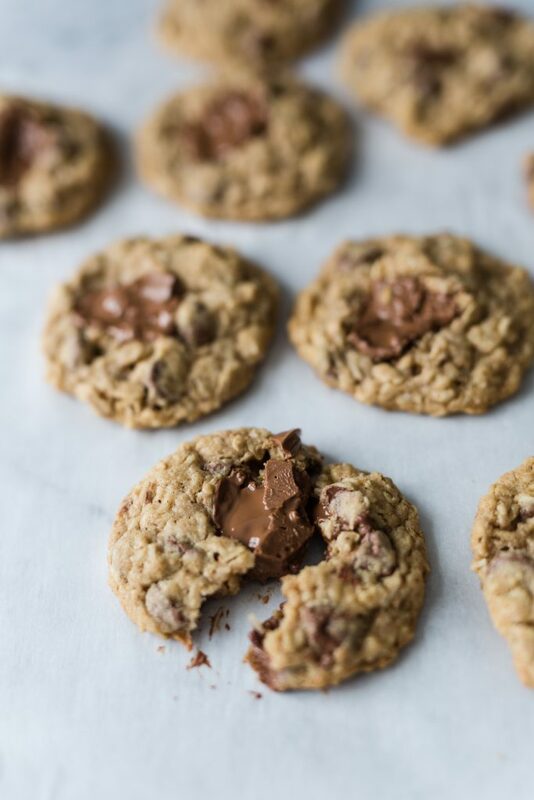 I used chocolate chips in this cookie and placed a small chocolate chunk on the top of each cookie because first of all it looks good and second, the kids take the cookies that look like they have the most chocolate in them. I prefer oatmeal cookies with chocolate in them, cinnamon free but you have the option to add cinnamon. I would recommend 1/2 teaspoon. I use Ghirradelli milk chocolate or dark chocolate chips but my favourite is Lindt milk chocolate or dark chocolate bars, chopped. In the bowl of a stand mixer, combine the butter and sugar. Mix until its light and fluffy and pale in colour. About 5 minutes. Scrape the bowl down. Add in the egg, mixing until fully combined. Add in vanilla and coconut and combine. In a small bowl combine, the flour, rolled oats, baking soda, baking powder and sea salt. Add the dry mixture to the butter mixture and mixing on low speed just until combined. Fold in the chocolate. Using a cookie scoop, divide the dough evenly onto the prepared baking sheet. Bake for 9 minutes. (this will leave soft centres) For a crispier cookie, bake 1 minute longer. 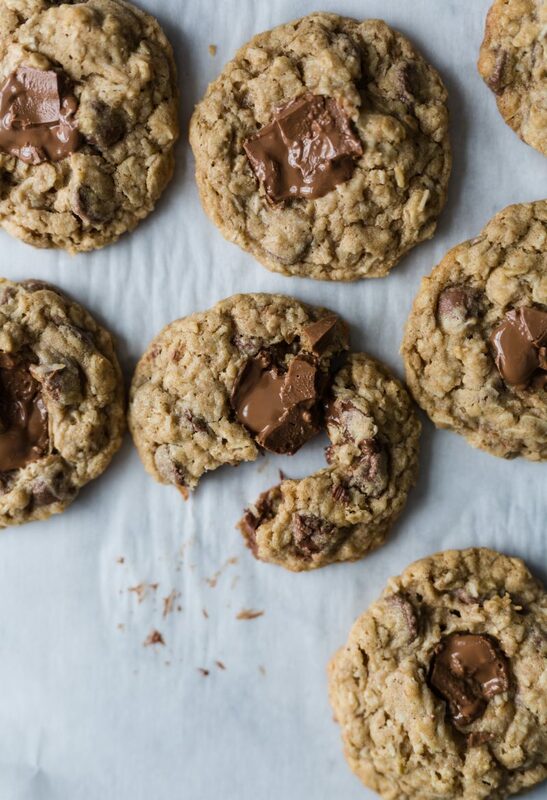 Tip: after each cookie is divided, I place a chocolate chunk on top of each cookie, pressing it slightly into the dough.